There are approximately 31,000 Combined Sewer Overflows (CSOs) around the UK. Their sole purpose is to discharge untreated human sewage and waste-water when the sewerage system is overloaded. CSOs act as emergency discharge valves in our sewerage system, discharging untreated sewage and wastewater when the system comes close to bursting, supposedly during periods of intense rainfall. Without CSOs, sewage could start backing up in our houses and gardens, so they are a vital part of our sewerage infrastructure. However, SAS is increasingly concerned that they are being used to regularly dispose of untreated sewage, even during times of low rainfall or none at all. 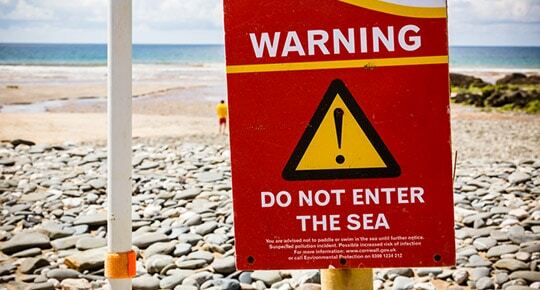 During the 2015 bathing season our Safer Seas Service reported on 926 sewer overflow events across the English beaches in the service. Only 11% of these discharges could have been monitored by the Environment Agency, leaving 821 discharges to impact the environment unchecked. Surfers Against Sewage sits on a European Commission expert panel reviewing the bathing water directive, Defra’s Cleaner Seas Forum and various regional Bathing Water Liaison Groups. CSOs are usually hidden out of sight so make sure you check your beach’s bathing water profiles to locate the nearest CSO, and the parts of the beach and bathing water that will be affected when it is discharging. You can find the bathing water profiles on your beaches profile page on the Sewage Alert Service map. Be aware that after periods of rain, CSOs are likely to discharge untreated human sewage and waste-water. And remember, CSOs discharge more frequently outside the bathing season.